We’ve played this game before. It derived from a bit by podcaster Adam Carolla, who takes inane statements from politicians, celebrities and people in the news and asks: Are they stupid or are they lying? Today’s episode of “Stupid or Liar” focuses on the death of Justine Ruszczyk (Her name was not Damond. It was going to be Damond after she was married. If America adhered to that as the journalistic standard, my high school yearbook would have referred to me as “Sir Michael Harriot, husband of Janet Jackson”). 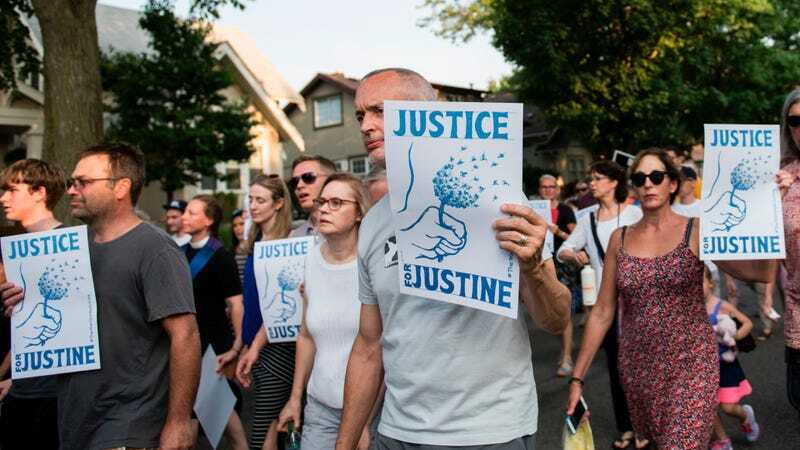 Less than a week after Justine Ruszczyk was killed by a fatal gunshot wound to the abdomen from a Minneapolis police officer’s gun, the police chief has been forced out, the mayor is on thin ice, and the new chief is an African-American man with deep roots in Minneapolis. As soon as I heard about this incident, I ran to my computer and waited. I’ve seen the routine so many times, I knew exactly what would happen. Immediately following her death, some industrious news reporter would release her criminal history—even if it had no bearing on the shooting—like media outlets did when they reported the killings of DeJuan Guillory and Walter Scott. If she had a clean criminal record, they’d at least put out the most menacing, villainous photo of her, the way they did Trayvon Martin. They’d go back as far as her high school teachers or her neighbors to find a personality defect that would adequately describe why the valiant hero cop feared for his life. I sat patiently in front of the screen waiting for a Google alert from the mayor, police chief or police union explaining how there was no need to jump to any conclusions or take any actions until they conducted a “thorough investigation.” I knew it was coming. It always happened this way. During my wait, an attorney called Ruszczyk the “most innocent” police shooting victim he’s ever seen. Robert Bennett—the lawyer who made these comments—is either blatantly lying or he is the stupidest white man in the long, storied history of stupid white men. Is there even a superlative for the word “innocent?” If so—is Justine Ruszczyk more innocent than Rekia Boyd, who was simply talking on her cellphone when an off-duty cop fired a bullet into her skull? Was John Crawford III’s innocence permanently erased in the .36 seconds it took for cops to burst into Walmart and eliminate his existence for the unmitigated gall of buying a BB gun? A lawyer like Bennett, who represents “high-profile police-shooting victims,” would know about these cases. If he doesn’t, then, by definition, that makes him stupid. 1. having or showing a great lack of intelligence or common sense. I’m sure an article like this will be coming out about Justine Ruszczyk pretty soon. I know it has been over a week, but she’s from Australia, which is another country on the other side of the world, which means reporters probably have to translate her criminal record from Australian to English, which could take a while. I’m sure that’s what the holdup is about. While I’m sitting here, I might as well wait for the All Lives Matter people to explain how we don’t know the whole story. Blue Lives Matter will probably come out en masse, too, to defend the honor of the Somali cop who shot her. If they don’t care about race, then the All Lives Matter advocates will implore us to wait until authorities do their due diligence. That’s probably what’s going to happen, right? Unless they were lying this whole time. To be fair, maybe the All Lives Matter people are so blinded by the combination of privilege and reflexive defensiveness that comes free in every package of white supremacy that they have no idea that responding to “Black lives matter” with “All lives matter” is akin to telling a man dying of a heart attack about their bout with acid reflux. Perhaps they don’t know that there is not a sane human being in the United States who wonders whether white lives matter. Maybe All Lives Matter is just stupid. The man who killed Rekia Boyd was acquitted of involuntary manslaughter because—according to a judge—the fact that he fired an unregistered weapon into a dark alley wasn’t proof of “recklessness.” Two days after Ruszczyk’s death, federal authorities declined to press charges against the cops who shot John Crawford. Anyone who insinuates that Crawford, Boyd, Castile, et al. were not as innocent as Ruszczyk are conflating innocence with whiteness. None of the others had committed a crime. All of them are dead. The media immediately named her shooter—as did the city of Minneapolis—as a Muslim of Somali descent. Staunch conservatives and white allies alike all say this has nothing to do with race. Quick—tell me Jeronimo Yanez’s religion. Can you tell me from which country Officer Sean Williams—John Crawford’s killer—descended? Stupid liars, the whole lot of them. None of this is Justine Ruszczyk’s fault. She is as blameless as the previously mentioned victims—but not more so. It is disingenuous to have a discussion about this entire incident and sidestep the obvious fact that part of the uproar about her death stems from the fact that she was a classically attractive white woman. Anyone who does so is either being dishonest or willfully ignorant—two euphemisms for ... you know. In just six days, Justine Ruszczyk’s death uprooted the entire government of the 46th-largest city in America. Two countries are outraged. People of all colors, religions and ethnicities are protesting. They all have a right to be upset, but we should be clear: If it had anything to do with the fact that Ruszczyk was a bride-to-be, Sean Bell’s killers would be in jail. If it had anything to do with the fact that she was the one who called 911, then the men who shot Brendan Hester would be locked up. If her immigrant status makes others empathetic toward this tragedy, where were these same outraged advocates for swift justice when the men who shot Amadou Diallo walked away scot-free? Justine Ruszczyk is an innocent, pure victim because she is white, and we all know it. No one wants to admit it, so I’ll just sit here and wait for them to treat her with the same disrespectful criminal taint that they do every victim of color. Maybe they’ll find a stash of CDs she was trying to sell or uncover a stash of loose cigarettes. Maybe there were Skittles in her pocket. I’m sure they’ll dig up something. I’ll wait. There’s no way I’m that stupid.